Whats the best time to train? If you don’t already train at a consistent time thats an irrelevant and hypothetical question. Whats the best type of cardio? Unless you’re already consistently doing some sort of CV thats an irrelevant and once again hypothetical question. If I do a bunch of CV will I lose my gains? Unless you’re already sub 10% body fat that isn’t really a question of any relevance right now. Whats the best supplement for fat loss? Unless you’ve got a consistent diet and training pattern its an irrelevant questions. If you can’t tell me how much weight you’ve moved in a week, sets, reps and exercises alongside the amount of calories you’ve consumed daily that first question isn’t valid…..yet. Should I train fasted or fed? You should train first. If you’re not doing that consistently, fed or fasted is of zero relevance. Whats the best diet for…………? If you can’t tell me what your current diet is that questions irrelevant. Can’t be arsed to write it down for me. Irrelevant. How many calories should I consume? If you can’t tell me how many you currently consume I can’t help only guess as far as a mathematical equation you can find on google will tell me. Whats better light weights and high reps or low reps and high weights? Irrelevant question as you’re probably telling me that you’ve done neither for any consistent period of time otherwise you’d probably have a good idea of the answer for you. How many carbs should I consume? How many calories ARE you consuming? If you can’t tell me that the first question is irrelevant. Now don’t get me wrong. There is an answer to a lot of them. Problem is I’m telling you something that right now has an insignificant impact on your results. Also you’re fundamentally asking me for directions before buying a car. 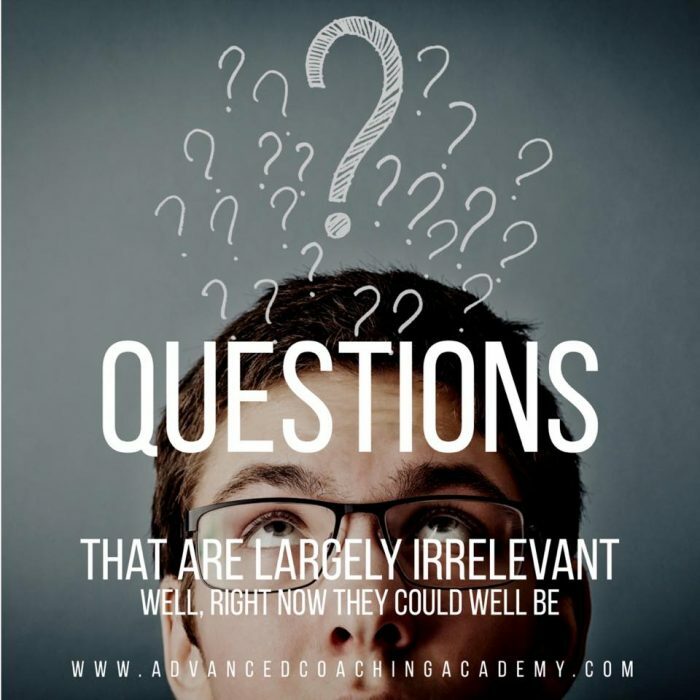 There is however no such thing as a stupid question but maybe this will help you filter which questions aren’t relevant for you right this second. A good coach will guide people with whats relevant and needed to build fundamentals.